Carnevale in Italy is similar to Mardi Gras in the US. It is a two to three week (sometimes longer) period of festivities before Ash Wednesday (40 days before Easter) and the beginning of the spiritual renewal period of Quaresima or Lent. Because the date of Easter changes yearly, so does the date for carnival festivals which can be anywhere from the end of January - March 9. 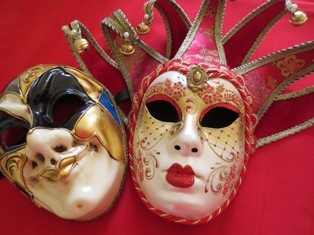 The dates for Carnevale this year (2019) are February 16 through March 5. During Carevale, daily and nightly events take place and include all types of merriment: street performances, extravagant costume balls, masquerades, parties, sumptuous dinners, parades with spectacular floats, music, gondola parades, and games for children. Beautiful fireworks usually conclude the festivities on the final evening. One of the distinctive elements of Carnevale throughout Italy are the colorful carri (floats) made of papier-mâché; often created on a huge scale. These are carefully constructed each year in the months leading up to Carnival, The floats always have themes related to scathing political satire or current affairs and feature giant caricatures of politicians or TV personalities. The largest and most elaborate of all the festivals take place in Venice, Verona (the oldest), Viareggio, and Cento. Carnevale di Venezia is an annual international festival. Venice's Carnival celebration lasts for nearly 2 weeks. A large number of visitors from around the world come to Venice for Carnevale. Events are held nightly in various locations throughout Venice and include masquerade and costume balls, concerts, dinners, and festivals. Elaborate masks and costumes are worn in the public squares, and at parties and balls. Carnevale masks are a big cottage industry in Venice and are sold year round. One of the most important Carnevale events is the contest for the best mask during the last weekend of the Carnival. A jury of international costume and fashion designers votes for "La Maschera piu bella". Not far from Venice, Verona has one of the oldest carnevale celebrations in Italy, dating from 1615. On the day of Carnival (Shrove Tuesday or Fat Tuesday) Verona has a huge parade with more than 500 floats. 15,000 kg (about 3,300 pounds) of candy are thrown out into the crowd. The Carnival of Ivrea, which is a town in the Piedmont region, has ancient origins dating back to the Middle Ages. Today it is best known for its peculiar traditional carnival. The main celebration centers around the locally famous Battle of the Oranges. This involves thousands of townspeople divided into teams, who throw oranges at each other. When you walk around with a red hat in Ivrea during the battle, people say you're wearing the berretto frigio and therefore you must be free to pass unharmed. The red hat means you won't be throwing oranges and therefore no one will throw oranges at you. a dancing parade that takes place through town to the lively accompaniment of traditional music. In the small mountain town of Sirignano northeast of Naples, carnival celebrations include a dance called Laccio d'Amore. This dance takes places around a tall pole with couples dancing together while holding onto a long ribbon attached to the top of the pole. The colored ribbons form an intricate pattern down the pole as the dancers perform this elaborate dance. At Carnival time in Italy there’s an Italian expression, “A Carnevale ogni scherzo vale!” (“During Carnival anything goes!”). Carnevale is a time to let loose, have fun and enjoy the rich foods and sweets that are forbidden during the fasting period of Lent. Of course, Carnevale would not be complete without food. The word carnevale derives from the Latin “carne vale” or farewell to meat. As Ash Wednesday approached, people were obliged to fast. In the south of Italy and especially around Naples, the end of Carnival on Fat Tuesday, is celebrated by eating Lasagne di Carnevale or Lasagne alla Napoletana. Families traditionally gather for a large meal that includes meats, sausages, cheeses and desserts that are avoided during Lent. 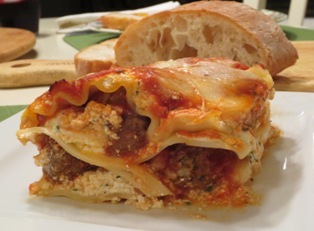 The lasagna is made with little meatballs (polpettine), sausage, and various cheeses. Some recipes also include other types of meat and/or hard-boiled eggs. 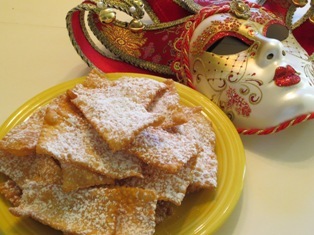 There are a number of sweets that are typical of Carnevale and fried pastries are one of them. They are usually strips of dough that are fried and dusted with confectioners’ sugar or drizzled with honey. Every region of Italy has its own version and name for these sweet fried pastries. Chiacchiere, Frappe, Cenci, Galani, and Bugie are just a few of the names. On the Amalfi Coast, you might find a drop of limoncello in the pastry dough which adds a refreshing lemony scent. Fried desserts are common during Carnival because so many of its traditions developed hundreds of years ago, before most home kitchens had ovens. 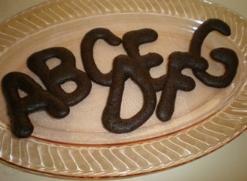 Frying was then the most practical way to prepare dough-based sweets at home. 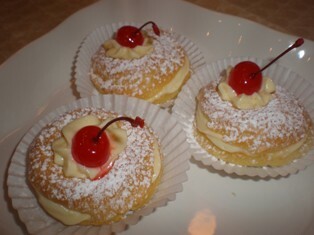 Other Carnevale desserts include cannoli, crema fritta (fried cream), cassata, and apostle’s fingers. Schiacciata (pronounced ski-ah-CHA-ta) is a flat cake served by Florentines during the Carnival season. Schiacciata is instantly recognizable for the "giglio," a stylized fleur-de-lis and the symbol of the city of Florence, dusted over the top in contrasting cocoa powder.It is a simple cake to prepare because all the ingredients are combined in one bowl. The cake is flavored with orange zest and olive oil. While some recipes use yeast, this version is leavened with baking soda and can be assembled in about 15 minutes. 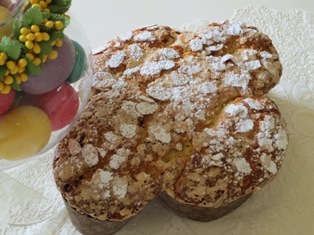 It is a lovely sponge cake with a very pleasant, fruity flavor. Schiacciata can be served with coffee for dessert but it's also nice with a slightly sweet fortified wine. This artist quality ultr-thick cotton canvas print is wrapped around a wooden frame. Made with fade-resistant UV archival inks it comes with a hanging accessory kit.